Big Daddy is taking it south of the border with this Mexican madness meal! Kicking this fiesta off is a Chili-Pork Empanada with an Avocado Dipping Sauce that'll rock you're world all the way to Mexico! 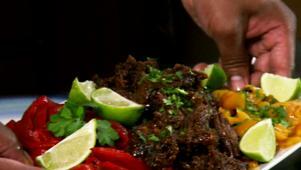 Next up, are the Boneless Short Rib Tacos with Smoked Peppers - your friends will jump out of their chairs for more! 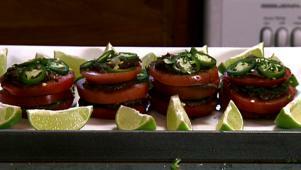 To end this meal of madness, it's a Spicy Tomato Napoleon with Grilled Jalapenos and Black Beans. Be sure to invite your friends - you'll want to share this flavor fiesta with the fellows! These short rib tacos will have your friends and family begging for more. Aaron's chili pork empanadas will rock your world all the way to Mexico. 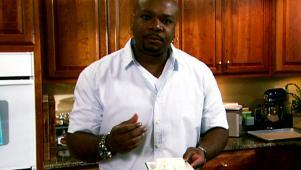 Aaron makes spicy tomato Napoleons with grilled jalapenos and black beans.